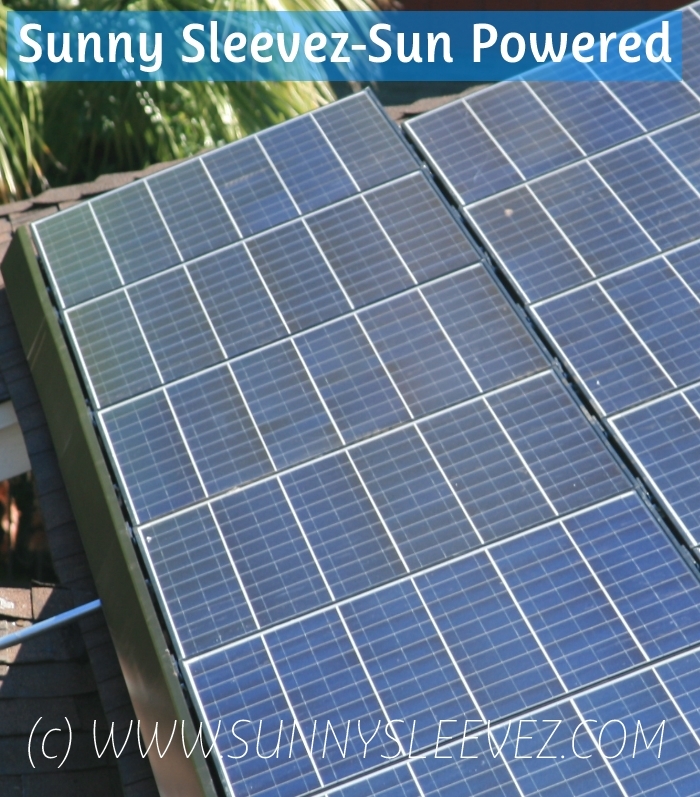 Why are Sunny Sleevez a greener sun protection option? Sunny Sleevez keeps lots of nasty chemicals off your skin. 80% of sunscreen used is applied to the arms. Sunscreens are a major contributor to the decline in coral reefs. Print shops are often hot, windowless, grim places to work. Not so at Sunny Sleevez. Instead of powering gas or electric dryers to cure our inks we solar cure, it takes a bit longer but we think the earth is worth saving. No wasteful A/C's, we find that opening the window and using ceiling fans are a great way to keep cool and well ventilated and now Sunny Sleevez Offices are SOLAR POWERED! Sunny Sleevez are printed using water based inks, all water used to wash screens is reclaimed to irrigate surrounding landscape. We even compost left over thread and dryer lint! We will no longer be wasting paper by sending a printed packing slip with each orders, customers & resellers able to place and track all orders online. Packages are shipped in reusable mailers made from 100% recycled grocery bags. Using 1 pair of sleevez through just 2-3 summers (they may well last much, much longer) will keep up to 36 plastic bottles out of landfill & 8 litres of chemical goop off your skin! Manufacturing Plastic also exposes workers to increased risk of various cancers as well as skin and lung diseases. Skylight Tubes reduces the need for electric lighting and LEDs have replaced outdated electricity hogging bulbs. Sunny SleeveZ manufactures in Los Angeles & all Sunny BeadZ are made in the USA and assembled in California. To reduce our carbon emmisions all orders ship via US postal service. We are constantly looking for ways to reduce our footprint.